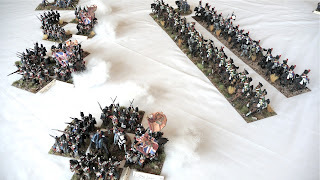 I hosted a Napoleonics game for the guys this past weekend that was another one of my hypothetical 'what-if' scenarios - as JohnB was kind enough to bring down his beautiful Russian collection from Saskatoon, this game was set in Poland around Christmas 1806. October 1806 had seen the French crush the Prussian army at the twin battles of Jena-Auerstaedt and by December Napoleon his Grande Armee was encamped in Poland, preparing to bring the Russians at bay in the upcoming spring campaign. Wanting to catch the French unprepared while they were scattered in their cantonments, the Russians decided to initiate a surprise winter offensive. Nonetheless, by pure coincidence, at that same time Marshal Ney unilaterally decided to move his corps forward into a better foraging area. So the two forces began to move very near to one another, close to the Baltic coast. In London, with the defeat of the Prussians and the subsequent advance of the French army into the Baltic region, the British were becoming very concerned that Denmark, with its significant navy, was at risk of being annexed by France or worse, would be convinced into a French alliance. Accordingly, discussions had been going on between Britain and Denmark with the British 'offering' to quarantine the Danish navy until the end of hostilities with Napoleon. Not surprisingly the Danes were not interested. In fact, the Danes were so concerned about British intentions that they decided to purposefully winter portions of their fleet within the Baltic icepack in order to prevent the British navy from taking them as prizes. So several groups of Danish ships-of-the line duly anchored themselves off of areas of the Baltic shore to let the oncoming ice provide a buffer around them. 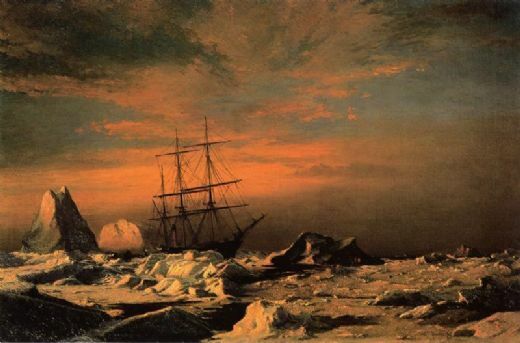 The British got word of the Danish plan and were panicked when they learned that very little kept Napoleon's approaching forces from taking the ice-locked ships for themselves. Hotter heads within the Cabinet prevailed and it was decided to send a small expeditionary force to seek out one of these 'ice anchorages' in order to fire the ships, preventing them from falling into French hands. So, the scenario starts with the British having already landed a brigade on the coast of Poland. This force has marched north through the day to the location of the ice-locked Danish ships. They assaulted the ships that nightfall and set them afire. Both the French and Russian forces in the area have been alerted to the sound of explosions and the glow of the ships' fires and they have each decided to send a force to investigate. The action starts the next day, around noon, as the British are trying to quickly make their way to their sea-lift rendezvous. Nonetheless, emerging from the falling snow, a Russian division is seen to the British front, blocking their path, and to make maters worse a large French force has come into view on their left. The Russians and British are nominally allies, but the Russians are not too impressed at the the British landing in the theater of war unannounced not to mention unilaterally attacking a Danish flotilla without prior consultation. The French, with Ney in the lead, are delighted by their luck. Finally they have an isolated British force to thrash. They only need to use their interior lines to block the Russians while they finish off the British. So each force has an agenda. The British want to get off the Continent but do not want to leave their Russian allies in a complete lurch. The Russians have an option to 'make a point' by making the British bleed a bit before they allow them to exit. The French, who are technically outnumbered, have to quickly decide how they want to react before the allies can coordinate their actions.